circling Jen Delyth's iconic Celtic Tree of Life artwork. The green flag featuring a harp, is an older symbol of Ireland dating back to 1642. It has been chosen to represent Ireland and her people, at the heart of the Tree of Life. The original phrase Éirinn go Bráth translates to Ireland Forever, expressing allegiance to Éire - Ireland. Our ancestral roots reach back through the generations, as we celebrate our heritage through an ancient culture that continues to grow and evolve as a living tradition in our lives today. 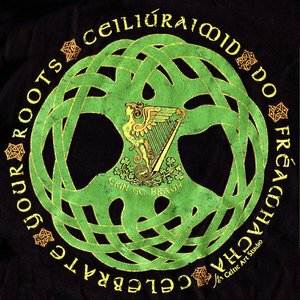 The Celtic Tree of Life represents the interconnection of all living things. The Ancients envisioned the entire cosmos in the form of a tree whose roots grow deep in the ground, branches reaching high into the heavens.